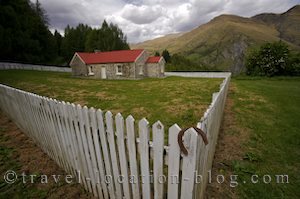 A look at the old Gold Rush and Lord of the Rings sites in the Skippers Canyon near Queenstown. After the disappointment of not going paragliding (after getting psyched up the night before and the morning of) because the operator, who'd promised two pilots, ended up only presenting himself for the flight meaning we'd have to go one at a time. This kind of defeated the purpose of our wanting to do the paragliding in the first place. So we headed back towards the town of Wanaka, then onto Queenstown via the Crown Range Road passing the historic Cardrona Hotel with the old vintage Chrysler parked outside. Just before Queenstown we turned off towards the historic gold rush village of Arrowtown and spend an hour or so there taking in it's quaint old streets and buildings. Then it was onto the crazy town of Queenstown. The face of Queenstown has changed dramatically from being a mere blip on the map to now being a major tourist city. We got the feeling this town had grown faster than its infrastructure had going by the lack of parking and services. Everything is expensive and even in the shoulder season the number of tourists is astronomical! We are booked on a safari tour in the afternoon which departs from Queenstown in a 4WD vehicle and takes us over the Skippers Road. Skippers Road is a an extremely rough road - so rough that rental vehicles are not permitted or insured to drive on it. The road took 7 years to construct and was almost all chiseled out of the mountain by hand rather than explosives. The road leads through the remnants of the gold rush days of the late 1800's and clearly shows the mark on the landscape that this industry inflicted through the use of sluices etc. This area was the second richest gold site in the world and produced around 800,000,000 ounces of gold during it's operation. These days the land is protected from further extraction of gold. Later on we are taken to a small community which was developed during the gold rush times - even in this seemingly hostile environment there were families living here plus there was even an old stone school house. As well as gold being an important part of this regions past, many scenes from the Lord of the Rings Trilogy were also shot here in various locations throughout Central Otago. We travel back out the same way we came in then head back to Queenstown. Tonight we drove in the general direction of Te Anau, finding a beautiful campsite on the southern shores of Lake Wakatipu.